You seriously need to make this salad. It’s healthy, simple to prepare and delicious. 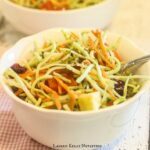 I don’t do this often, but I promise, you will LOVE this salad. It might sound weird with blueberries and vegetables, but it’s AMAZING! Between the fresh basil and the raspberry vinaigrette, it’s the perfect combination of flavors. Oh and it’s super healthy too. I’m telling you, MAKE THIS! I love the crunchy, nutty texture of farro. It is a whole grain and is packed with protein and fiber. It is made from wheat so it is not gluten-free. 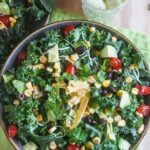 If you are looking for a salad that doesn’t contain gluten, maybe try substituting faro with brown rice, amaranth or quinoa. I don’t even usually like feta cheese and I loved it in this salad. Oh and it’s also so pretty so it’s perfect to bring to barbecues! By the way, I won’t be offended if you don’t feel like making the dressing (even though it’s ridiculously easy) and want to use a bottle dressing. Just make sure you read the ingredients and look for hidden sugars and preservatives. Look for one that’s preferably organic and has a small amount of ingredients. Mix the cooked faro with all of the ingredients for the salad. To prepare the dressing, add raspberries, honey, vinegar and garlic to food processor or blender. Slowly add oil and salt and stir or shake well. Add dressing to salad and mix well. Serve immediately or refrigerate until ready to serve. (I like to leave a little extra dressing to toss into salad right before serving). I hope you love this as much as I did! I love adding fruits to my salads. What’s your favorite fruit to add to a salad? It’s one of the best parts of summer! I bought farro recently and didn’t do anything with it. Thanks for sharing this, now I can actually use it! YUM. I love combining fruits and vegetables in salad. I discovered farro a few years back at (don’t laugh) CHEESECAKE FACTORY LOL! They had it on their “Skinny menu” and I ordered it since it was something new and I’ve been in love with it every since. I had a summer salad recently at a restaurant in Old Montreal – farro, feta, sliced pork loin, berries, watermelon, yellow grape tomatoes and celery w/a kiwi dressing – best thing I have eaten in a log time and as you would say Lauren, I was in my happy place! This salad has so much balance i it! 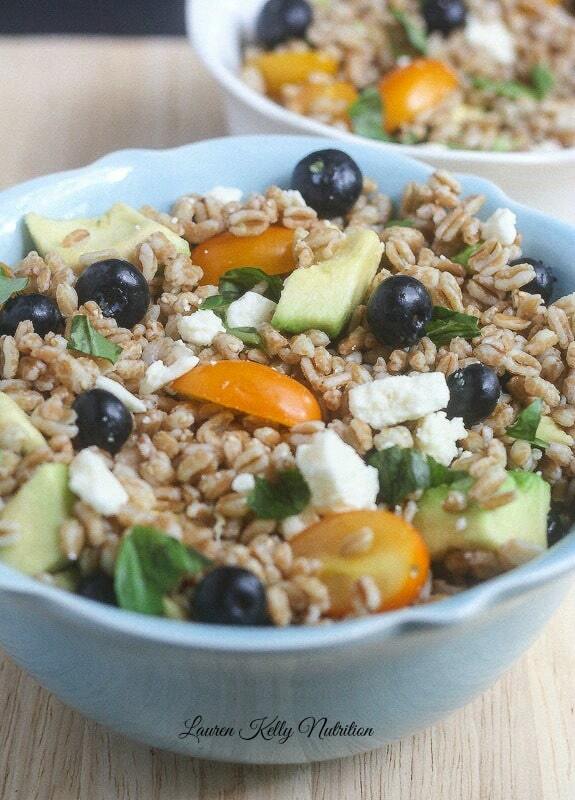 The sweetness of the blueberries with the savory of the farro and feta! Perfect! Could I substitute the farro for another whole grain like quinoa or couscous? I have a ton of quinoa that I need to use! Thank you Amanda! Yes you could definitely use quinoa. I hope you like it!! I bet we would love farro and I bet that we would really love this farro salad! It’s so pretty! Thanks Ash! I hope you like it! I love faro and the dressing sounds delicious, I must get my hands on some grape seed oil! 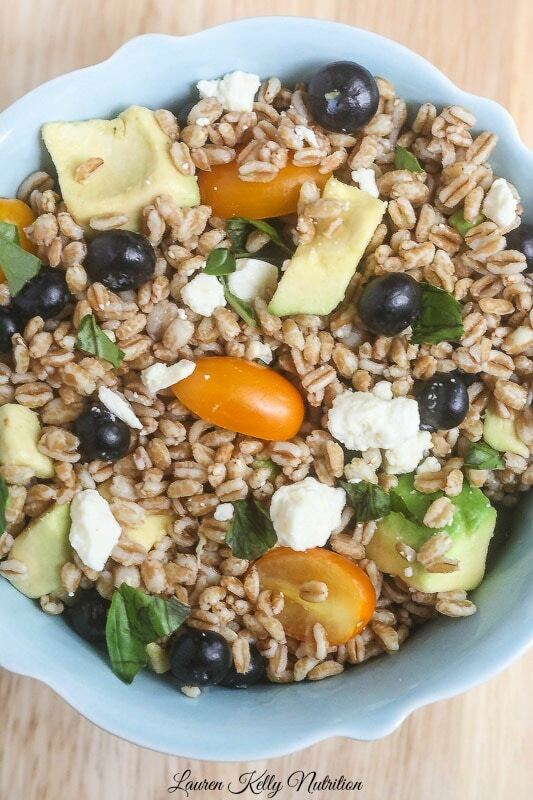 ive never used farro in a salad before, definitely something i need to try. thanks for sharing the great recipe! I have never had farro before. I don’t even think I’ve seen it on a menu! You know farro is one of those things I have always wanted to try and make and I have yet to get around to it. Now I want to try it even more! Love the chunks of feta! This salad is screaming my name! 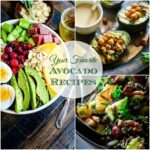 I love every single ingredient! I HEART farro with the near intensity of the sun. There, I said it. I am, however, a salad idiot. Never know what to put in ’em. This salad is so balanced and beautiful. I’m just drooling! I love farro but I have a box of the real kind (not quick cooking at home) and I’m too lazy to take out the hour + time it takes to make it. I’m so bad but this salad looks so good, I need to get past that! 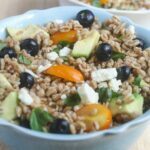 I love a good whole grain salad (especially farro), but I haven’t done it with blueberries – must try! I hope you enjoy it Julie!! Oh thank you so much Shelley! I looooove Farro Lauren and this is a lovely combination! 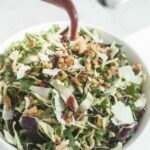 I made this salad last week with freekeh rather than farro – it was fabulous. I didn’t use all the dressing even though the salad was refrigerated for a couple of hours before we ate it – saved the rest for other salads. Thanks of telling me Laura, I am so glad you liked it!